Following our stroll through The High Line and a festive deep-fried breakfast, The Astronomer, Sonia, and I headed to Parm for a late lunch on our first full day in the city. Here at this quaint spot in Nolita, Chefs Rich Torrisi and Mario Carbone celebrate and “elevate” Italian-American cooking in all its red sauce glory. 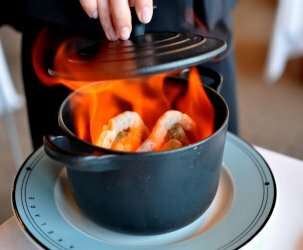 With quite a bit of buzz surrounding the restaurant, including a 2-star review in the Times, I was more than a little excited to experience what all the hubbub was about. Plus, I hadn’t eaten any parmigiana, be it meatball, veal, or eggplant, since graduating from college, so it was high-time I got my fill. We arrived sometime past 2 PM and waited a quick minute before being seated. Sonia’s dined here just about a dozen times, including the night before, so she led us through the restaurant’s greatest hits. I also cribbed some notes while reading Pete Wells’ write up, so we were all set on the ordering front. 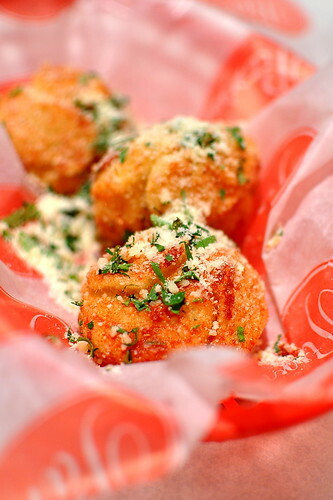 We started with a slew of appetizers, including warm-from-the-oven “Pizza Knots ($5)” sprinkled with crumbly Parmesan and fresh parsley. 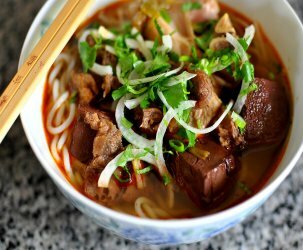 Whereas classic pizza parlor “knots” are doughy, greasy things that have a way of hijacking one’s stomach, these were lighter specimens with a definite crust and fluffy innards. 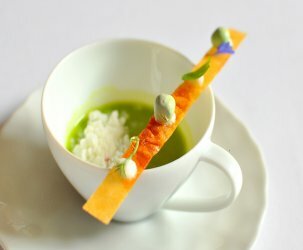 While I could’ve gone for seconds, the portion size allotted us only a knot each. Perhaps this was for the best considering how much food was coming our way. 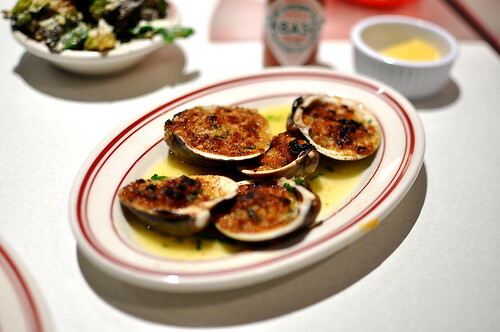 I insisted on an order of “Baked Clams” ($10) since Mr. Wells spoke so highly of them in his review. While the sesame bread stick topping was nice and toasty, the flavors didn’t hit it out of the ballpark like I had hoped. The shining stars of the starters were the vegetables, which are available for $6 each or 3 for $15; we went with the latter. 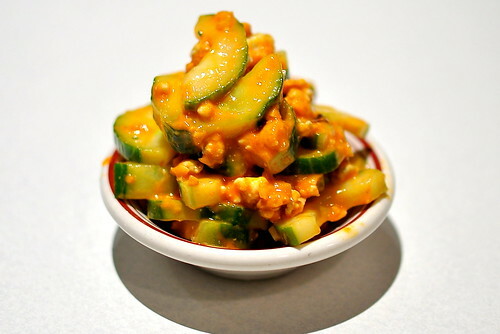 The “Buffalo Cucumbers” came slathered in a tangy dressing usually reserved for sports bar wings with pungent bits of blue cheese throughout. Can you dig it? I certainly can. 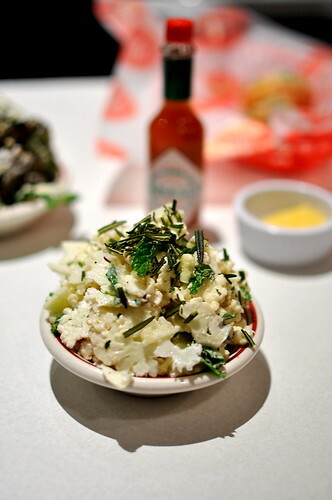 The “House Cauliflower” with fresh mint and rosemary was also lovely. We liked how the florets were sliced thin rather than left in chunks. 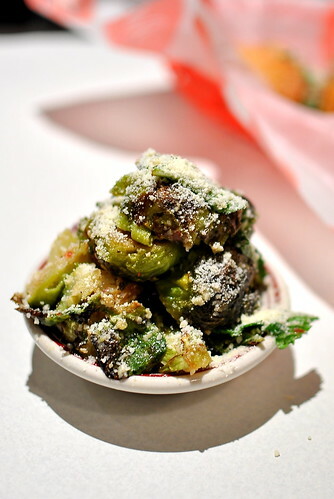 And finally, the Brussels sprouts with fresh herbs and powdery Parmesan, which was my favorite of the bunch. Moving on to the “parm” portion of our meal, The Astronomer and I shared the “Meatball Parm” ($9) served on a semolina roll. 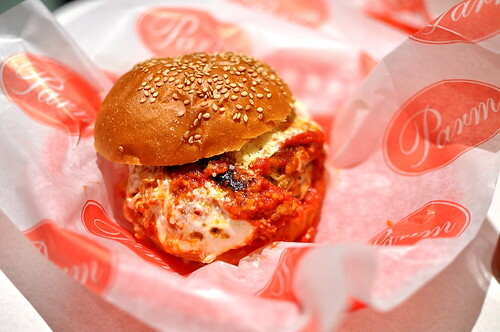 While the loosely-packed meatball made from veal, beef, and sweet Italian sausage was very tasty, especially with the gooey mozzarella, it was the fresh basil that made this sandwich highly memorable. 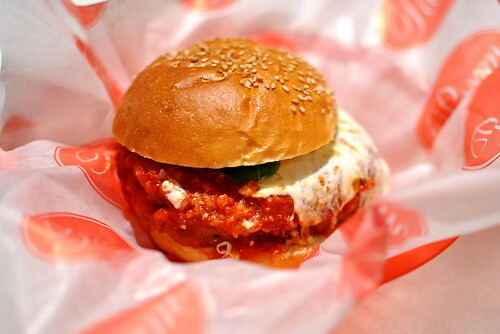 Sonia’s go-to sandwich, the “Chicken Parm” ($9), was dependably delicious with its moist meat and melty mozza. 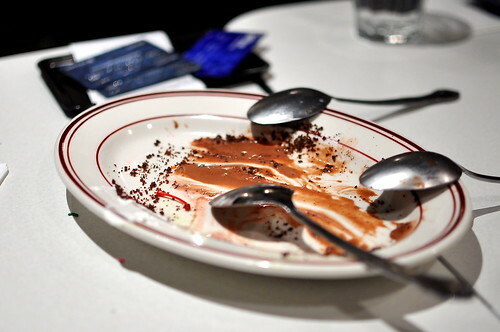 The absolute highlight of the meal came at the very end: the “House Made Ice Cream Cake” ($12), a triple threat of chocolate, strawberry, and pistachio ice creams anchored by brownie layers and crumbs and topped with rainbow sprinkles and a maraschino cherry. 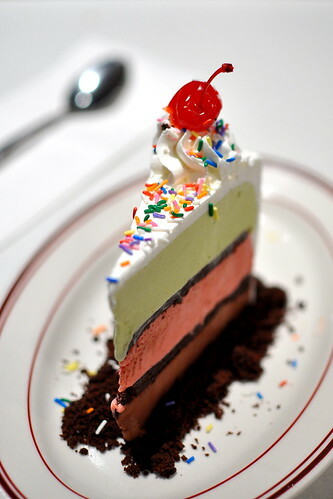 Spumoni never looked and tasted so damn good. With the exception of dessert, the food at Parm didn’t make me wanna sing at the top of my lungs or switch coasts or do anything crazy like that. The Italian-American cooking was solid, with a real sense of place and humor, while the setting was way cuter than your average hoagie joint. 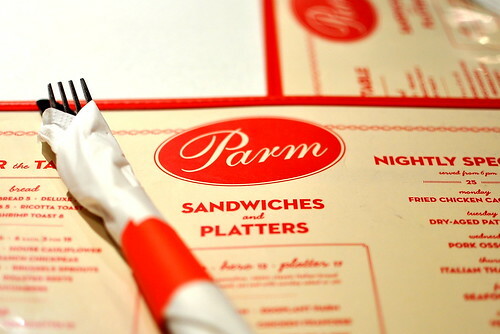 I like Parm. I love the ice cream cake. 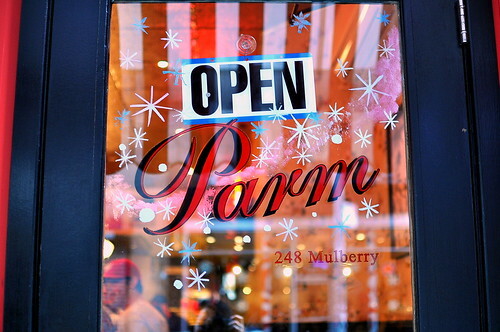 Those sandwiches look great..and pretty reasonably priced too for NYC standards. A fair and balanced review. In other words, I agree with you!